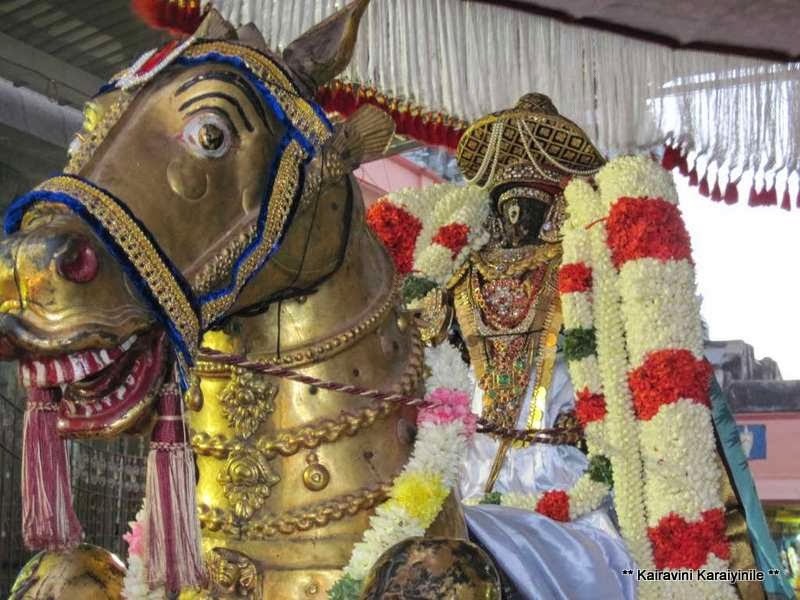 Kairavini karaiyinile - திரு அல்லிக்கேணி குளக்கரையோரம்: Vijayadasami Paarvettai purappadu at Thiruvallikkeni : திருவல்லிக்கேணி "விஜயதசமி" புறப்பாடு. 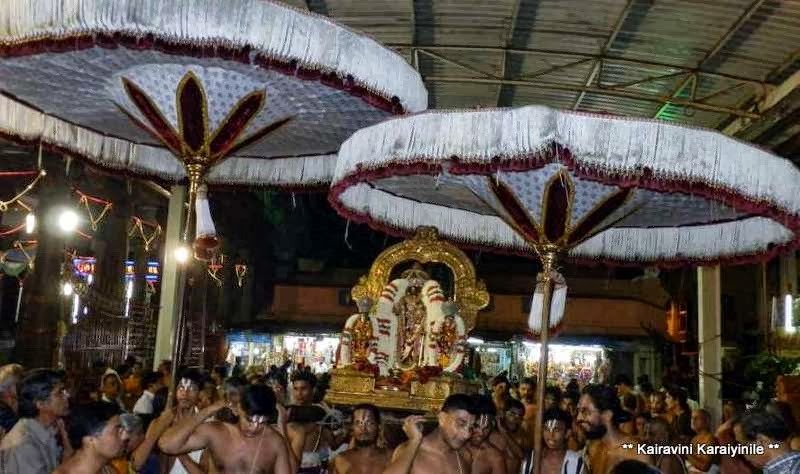 Vijayadasami Paarvettai purappadu at Thiruvallikkeni : திருவல்லிக்கேணி "விஜயதசமி" புறப்பாடு. The next day is Vijayadasami ~ the day considered most auspicious for starting learning. Children are put in schools and taught the first syllable known as “Aksharabyasam”. This year Vijayadasami fell on 14th Oct 2013. On this day at Thiruvallikkeni, there was to be purappadu of Lord Parthasarathi on ‘kuthirai vahanam’. In the epic Mahabaratha, during their exile Pandavas had to spend a year without revealing their identities. This period was spent on Virada desam. This is explained in detail in Virada parvam of Mahabaratha. On Vijayadasami day which coincided with completion of their one year in exile, in the war to protect Virada kingdom, Arjuna took back his bows and arrows hitherto hidden in a ‘vanni tree’. On Vijaya Dasami day at Thiruvallikkeni, ‘vanni tree parvettai’ is enacted every year. This is symbolically celebrated at the entrance of the temple itself ; in olden days [till a decade ago] this act called ‘paarvettai’ took place in Vasantha bungalow situate in Venkatrangam Street. Now that picturesque bungalow and the mantap are no longer there. 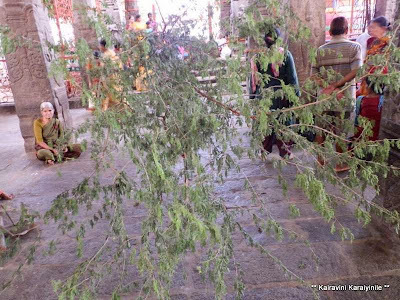 At the entrance of the temple, leaves of vanni are symbolically placed and the Lord comes near the tree ~ after aarathi, couple of leaves get plucked by the battar representing the Perumal. 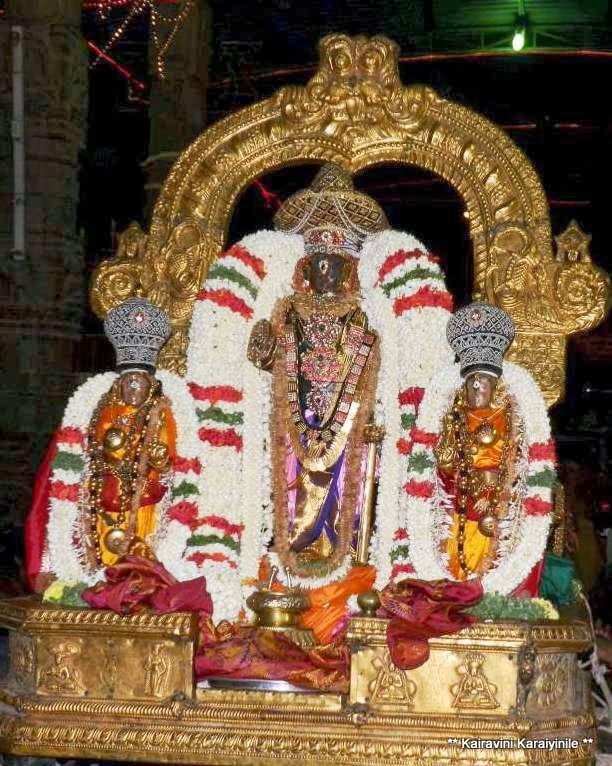 In the bhooloka Vaikuntam of Thiruvarangam – Num Perumal visits Kattazhigaya Singar temple located just over a kilometre East of Thiruvarangam Periya Kovil. The legend has it that wild animals constantly attacked the families of the rishis and consumed them. While the rishis, through severe penance, had the power to burn the animals just by their looks, they sought not to forego the fruits of their penance by killing these wild animals. Instead, they undertook a more severe form of penance invoking the blessings of Lord Narasimha. Pleased with their prayers, Lord Narasimha appeared before these rishis and is now worshipped at this place. 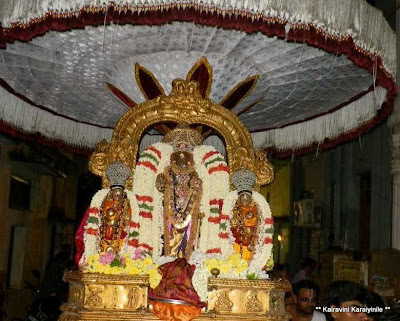 At Thiruvallikkeni, it was exceptionally a hot day…… Sri Parthasarathi Swami was beautifully decorated as an Emperor riding the golden horse and the purappadu was to take place around 0530 pm. It rained heavily impeding the vahana purappadu ~ hence Sri Parthasarathi had purappadu in Kedayam dressed in the same manner as He would have appeared atop the horse. It was indeed a great darshan to behold. 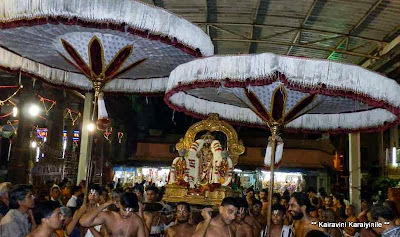 It was ‘Sthothira Padal’ goshti ~ Thadi Panchakam and Sthothra Rathnam were rendered. 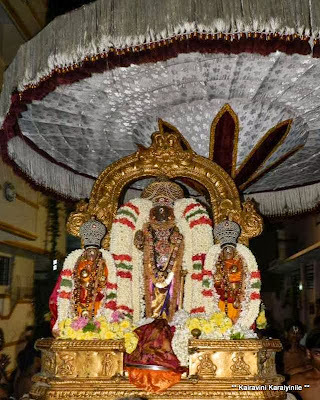 Perumal had kulakkarai purappadu – TP kovil 2nd street, Bandala Venugopala Street and then had periya maada veethi purappadu.